Toyota City, Japan, June 8, 2011—Toyota Motor Corporation (TMC) has added a small female and a large male to Version 4 of its THUMS* virtual human model, which makes possible analyses detailed to a degree which is not possible to achieve with conventional crash-test dummies. The models of a 153 cm-tall female and a 189 cm-tall male will join the 179 cm-tall average-build adult male in THUMS Version 4, released last year. All three models come in two types—a vehicle occupant and pedestrian—bringing the total number of models to six. 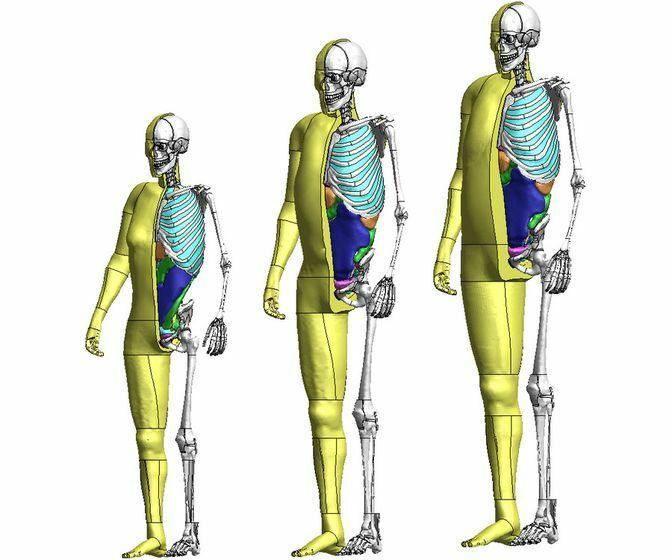 It is now possible to take into account different body sizes when conducting analyses of internal injuries caused by automobile collisions. Version 4 is the result of a cooperative development arrangement with Toyota Central R&D Labs, Inc., universities and other external research institutes to take detailed measurements of the human body's internal structure using a high-precision CT (computed tomography) scanner. By creating precise models of various internal organs including their positions and how they interconnect, TMC was able to develop a virtual human model containing approximately 14 times more information than the previous version. This increased detail allows finer understanding of how damage is applied to internal organs during a collision. Beginning this summer, the small female and large male models will be marketed to universities through Toyota Technical Development Corporation and to private companies through consultant JSOL Corporation. To realize the elimination of traffic fatalities and injuries, TMC will apply the results of THUMS tests to develop safer vehicles. Furthermore, TMC has plans to add an elderly person and a child model to make an even more diverse range of testing possible. *Total HUman Model for Safety. THUMS allows highly detailed analysis of bone fractures, severed ligaments, etc. by simulating many characteristics of the human body—ranging from the shape of the body to its skeletal structure and skin. TMC began developing THUMS in 1997 in cooperation with Toyota Central R&D Labs, Inc. Version 1 was completed and commercially launched in 2000, followed in by Version 2 in 2004, which added a face and bones to the model. Version 3, launched in 2006, added a precise brain model. Version 4, with detailed modeling of internal organs, was completed and released in 2010.